Chris Clingan Joins Travel Solutions. Travel Solutions has announced the appointment of Chris Clingan as Sports Travel Manager. 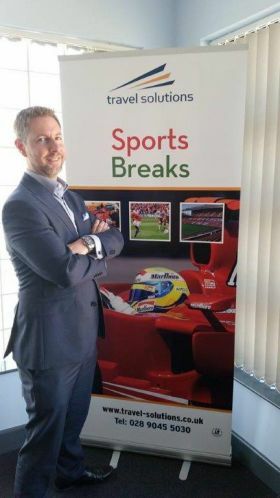 Chris has joined the team at Travel Solutions where he will be responsible for developing and managing the Sports Portfolio for Travel Solutions, as it continues to expand and develop. Chris brings with him a wealth of experience having managed Clingan Travel in Newtownards for 17 years before working with American Holidays as Reservations Supervisor. Commenting on his appointment Chris said, “I am delighted to be joining the award winning team at Travel Solutions and look forward to helping enhance and develop their growing portfolio of products and services”. He continued, “I believe the reason for people travelling is also changing, the growth and future are based on experiences - watching or taking part. Travel Solutions caters for that with all their range of sports related products, from Football, Horse racing, Rugby to Motor racing and special sporting events. If you ask people what is on their own bucket list, many now say top sporting events and experiences - We want to cater for that”.